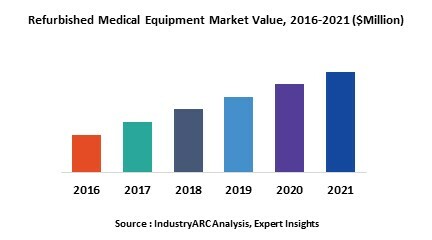 Refurbished medical equipment market is being primarily driven by factors like development of e-commerce platform enhancing the ease of purchase of refurbished medical equipment, growing demand for refurbished medical equipment in the private healthcare sector, rise in the awareness among people regarding refurbished medical equipment, increasing government initiative across the globe, growing demand for capital-intensive diagnostic imaging equipment. In addition, rising number of private hospitals and diagnostic centres, increase in adoption of refurbished medical equipment in emerging economies such as China, India and others, will create new opportunities for global refurbished medical equipment market. However, higher cost of the research and development, and complex government approval processes are the key restraints for global refurbished medical equipment market. Globally, development of e-commerce platform enhancing the ease of purchase of refurbished medical equipment, growing demand for refurbished medical equipment in the private healthcare sector, rise in the awareness among people regarding refurbished medical equipment, increasing government initiative across the globe, growing demand for capital-intensive diagnostic imaging equipment are the prime growth drivers of global refurbished medical equipment market. In addition, rising number of private hospitals and diagnostic centres, increase in adoption of refurbished medical equipment in emerging economies such as China, India and others, will create new opportunities for global refurbished medical equipment market. However, higher cost of the research and development, and complex government approval processes are the key restraints for global refurbished medical equipment market. Geographically North America dominated global refurbished medical equipment market because of high medical reimbursement facilities, privatization of the healthcare sector, and technological advancement. Asia Pacific is projected to have fastest growth, owing to rapidly increasing aging population, higher prevalence of cancer and cardiovascular diseases, rise in consumer awareness, favourable government policies, modernization of healthcare infrastructure, and growing medical tourism industry in developing nations such as China, and India in this region. Among all the products, medical imaging equipment has the highest market share in global refurbished medical equipment market. This report identifies the global refurbished medical equipment market size in for the year 2014-2016, and forecast of the same for year 2021. It also highlights the market drivers, restraints, growth indicators, challenges, and other key aspects with respect to global refurbished medical equipment market. 9.1. Block Imaging International, Inc.
9.2. Integrity Medical Systems, Inc.
9.3. Radiology Oncology Systems, Inc.